How do I throw a Curveball? I noticed an XP bonus (+10 base if it just hits, no extra bonus for good throws) for a "curve ball" upon catching a Pokémon. I have no idea how I did this, and would like to know how to replicate this for the future. When you start to see the ball "sparkle," release it. Pray that the ball lands on your target. The Pokéball will curve back in the same direction that it was spun, so spinning the ball counter-clockwise will result in the ball curving left. As a result, you want to aim right of the Pokémon. This method requires some practice, but is rather easy after getting the hang of it. 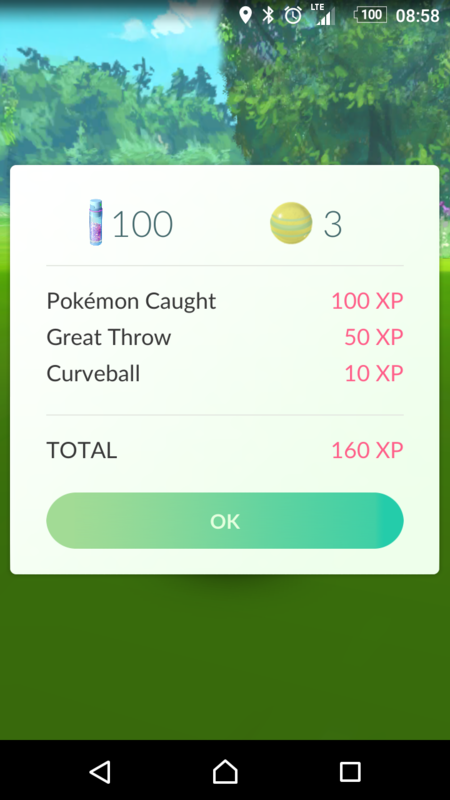 If a curveball is successfully thrown, the catch bonus multiplier for the Pokémon increases by a factor of x1.7, making it as effective as a straight Excellent throw. Many of the answers submitted are too complex. They are over-thinking. I throw curveballs every time and my hit rate has gotten quite high. To throw a curve ball, simply draw a spiral or number six on the screen. Draw from the inside of the spiral outward. You can draw your spiral clockwise or counter-clockwise; it works either way. Only one loop around the spiral is necessary. More loops make it harder to aim, and serve no practical advantage. And of course, practice, practice, practice. Not the answer you're looking for? Browse other questions tagged pokemon-go or ask your own question. What are the possible catch bonuses and how much experience do they reward? What's wrong with my curveball? Does spinning the Pokeball/making it sparkle increase the chance of catching Pokemon? There's a Pokémon in the kebab store! Can I turn off augmented reality? How to throw poke balls such that they do not miss? Why is there a difference between the height/weight in the Pokédex and Storage? Anyone else not getting bonus XP for “Nice!”, “Great!” or “Excellent!” throws? Does the chance of catching a Pokémon change with each throw?